Sunday February 28, 2010 was World Rare Disease Day. The purpose of the day was to spread the word about the need to research rare diseases. The National Organization for Rare Disorders headed the third annual event. NORD’s mission is to identify, treat and cure rare diseases through various programs. Information about rare diseases is limited; making diagnoses difficult and families often face a lack of research or resources. Rare diseases often have no cures. However, there are between 6 and 8 thousand known rare diseases with 75% of these affecting children (rarediseaseday.org). Congress passed the Orphan Drug Act of 1983 to encourage the development of drugs for rare diseases. A rare disease is one that affects fewer than 200,000 people in the United States. Prior to the passage of this Act, private industries were hesitant to invest in treatments because the drugs were expected to be unprofitable. To find out more about the benefits of this Act you can visit the review by the Department of Health and Human Services. Finding a treatment or cure for rare diseases often leads to advances in more common diseases and disorders. Dr. Leslie Gordon, Medical Director for the Progeria Research Foundation said, “Helping children with Progeria, with this rare and fatal disease, also helps us understand the biology of aging in all of us” (Findtheother150.org). The Progeria Research Foundation began the ‘Find the Other 150’ Campaign three months ago. The idea of the campaign is that there are statistically one hundred and fifty other children in the world with Progeria who are either undiagnosed or unknown by the organization. In just these three months there have been three children identified; two are from Brazil and one is from Turkey. PRF has set up a separate website to get the word out about this campaign. 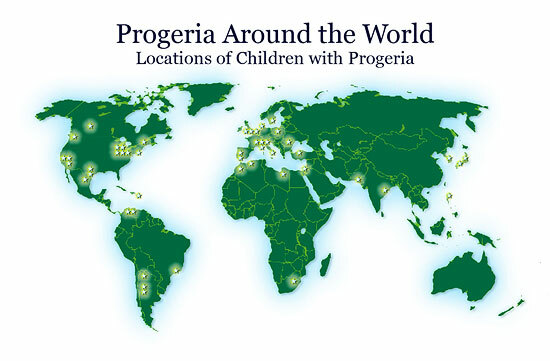 Press releases about Progeria are being released in six languages across the world. As a parent of a child with Progeria, I don’t want other parents to feel helpless in diagnosing and treating their child. The “Find the Other 150” Campaign will allow PRF to provide these children with life-changing treatments and connect them with local medical professionals and other families of children with Progeria. The symptoms of Progeria include osteoporosis, growth failure, loss of body fat and hair, joint stiffness, cardiovascular disease and stroke (ProgeriaResearch.Org). If you know a child with symptoms of Progeria, you can contact Audrey Gordon, President of the Progeria Research Foundation, at agordon@progeriaresearch.org.